A man "stupidly" pointed a laser at a police helicopter which was being used to look for a missing person, a judge has said. 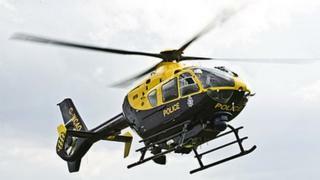 Gavin Hoskins, 26, from Bristol, flashed the laser pen at the helicopter on 20 January forcing the task to be abandoned. Hoskins was sentenced to five months in prison, suspended for two years. He previously admitted recklessly or negligently acting in a manner likely to endanger an aircraft. Hoskins, of Guinea Lane, Fishponds, had been looking for his dog which had escaped when he grabbed the laser pen, Peter Coombe, prosecuting, said. But realising the dog had gone down a cul-de-sac he started "playing" with the laser, shinning it at nearby rooftops. He then spotted the police helicopter and shone the laser pen up at it "three to four times". Hoskins later told police he did not think the laser, bought in Bulgaria for his young daughter, had the range to reach the helicopter, which was flying at 1,500 ft (450m). The helicopter - which is part of the National Police Air Service (NPAS) - was forced to abandon the missing person hunt to track Hoskins, who was then arrested by police officers on the ground. Hoskins still had the laser pen in his pocket and told police he was sorry and he had been "stupid". Sentencing Hoskins at Bristol Crown Court, Assistant Advocate General Alan Large told him: "What you did was stupid and potentially extremely dangerous. "In recent weeks there have been a number of helicopter crashes and you know the destruction and death that sort of thing causes. "These police officers were doing their duty... and you interfered with that." Hoskins was told the suspended sentence would be "hanging over his head" for two years. He was also told he must complete 200 hours of unpaid work within the next 12 months. Ch Supt Ian Whitehouse, from the NPAS, said: "When dealing with missing and vulnerable people time can be of critical importance. "Hoskins was stupid and reckless and we will deal robustly with anyone who uses lasers and puts lives at risk. Real people's lives are at risk - this is not some kind of computer game."